US Testing Equipment, LTD has been in business for nearly twenty-five years as the premier small business provider of security detection equipment with an emphasis on cargo and passenger checkpoint screening devices. As one of a very select few holders of a Blanket Purchase Agreement (BPA) with the TSA for the provision of Trace Detection consumables, we are intimately familiar with the nuances of a passenger screening operation. In addition, as an early awardee of a Certified Cargo Screening Facility (CCSF) we are well versed in the demands of the cargo screening environment. With our background in both people screening and air cargo screening we are uniquely qualified to provide you with the expertise you require to manage your screening and detection requirements. The Checkpoint Screening Equipment products we provide are state-of -the -art with a proven track record for reliability, accuracy and durability. The Rapiscan Itemiser Explosive Trace Detector and Rapiscan Itemiser 4DX Explosive and Narcotic Detector have a genealogy that traces itself back to GE Ion Track and the advent of the Ion Trap Mobility Spectrometer (ITMS), the science behind these trace detection units. A likewise unique piece of detection equipment is the Armstrong AMC-CD-2 Human Occupancy Sensor. Using a sampling wand and a beam of infrared light the unit will detect concentrations of CO2 (carbon dioxide). As a by-product of the breathing process, all humans and animals exhale carbon dioxide leaving a signature as to its presence. This product has been extremely successful in detecting stowaways and human cargo in trans-border shipments and has a growing popularity amongst military, homeland security and corrections organizations. If you are looking for products beyond those that we offer here or would like to discuss your checkpoint security requirements, please call us or send us an email. We are in the business of providing solutions and would look forward to helping you select the solution that works best for you. The newest technology in non-radioactive-based explosives and narcotics detection. Simultaneous dual-mode detection of explosives and narcotics in a powerful, portable trace detector. 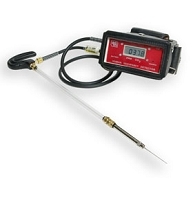 CO2 sensor provides a reliable indication of human occupancy in confined spaces.